Grant Masaru Imahara (born October 23, 1970) is an American electrical engineer, roboticist, and television host. He is best known for his work on the television series MythBusters, in which he designed and built numerous robots that were needed for the show, and specialized in operating the various computers and electronics that were utilized to test myths. Imahara starred in the Netflix series White Rabbit Project released on December 9, 2016. Imahara is a graduate of the University of Southern California, with a Bachelor of Science degree in electrical engineering. For a time, he seriously considered switching majors, with the intention of becoming a screenwriter; he decided to stay on the engineering track after assisting Tomlinson Holman, a professor at the USC School of Cinematic Arts. In December 2016, Imahara became engaged to his long-time girlfriend, costume designer Jennifer Newman. After graduation, Imahara was hired as an engineer for Lucasfilm's THX division; he then moved to the company's visual effects division, Industrial Light and Magic (ILM), where he worked for nine years. While at ILM, he was involved in films such as The Lost World: Jurassic Park, Star Wars: Episode I – The Phantom Menace, Galaxy Quest, AI: Artificial Intelligence, Star Wars: Episode II – Attack of the Clones, Terminator 3: Rise of the Machines, The Matrix Reloaded, The Matrix Revolutions, Van Helsing, and Star Wars: Episode III – Revenge of the Sith. Imahara is credited in many feature films as a model maker. In particular, he is credited for his work in updating the aging R2-D2 robots for the Star Wars prequel trilogy. As an official Artoo Technician, he makes a cameo appearance in the mockumentary R2-D2: Beneath the Dome. Imahara joined MythBusters on the invitation of friend and occasional employer Jamie Hyneman and former ILM colleague Linda Wolkovitch, who was an associate producer of MythBusters. He joined as the third member of the Build Team, replacing former MythBusters welder Scottie Chapman. His colleagues often jokingly refer to him as the "geek" of the Build Team. He often makes the robots that are needed for the show and otherwise specializes in operating the computers and electronics for the myths. On August 21, 2014, Hyneman and MythBusters co-host Adam Savage announced that Imahara, along with cast members Kari Byron and Tory Belleci, would be leaving the show. Along with colleagues Kari Byron and Tory Belleci, Imahara hosted the Netflix Original Series White Rabbit Project, in which the team investigated topics such as jailbreaks, superpower technology, heists, and bizarre World War II weapons, evaluated against a defined set of criteria and explored through experiments, builds, and tests. The complete first season of the series was released on the Netflix streaming service December 9, 2016, but the series was not renewed. 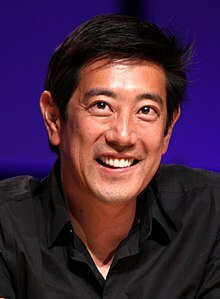 Imahara was a cast member and story writer for the short film Architects of Evil, created for the 2004 Industrial Light and Magic Backyard Film Contest. He mentors the Richmond High robotics team Biomechs #841 (Richmond Ca.) for the FIRST Robotics Competition, lending his expert guidance on how to create the right robot for the right job. Imahara was profiled in the magazine IEEE Spectrum, in an issue focusing on engineering dream jobs. The article was titled "Grant Imahara: Debunker in The Box. ; he is shown in a fire-resistant suit on the cover. One of Imahara's independent projects, during early 2010, was constructing a robotic sidekick for Craig Ferguson, host of The Late Late Show. The robot, named Geoff Peterson, was unveiled on the April 5, 2010 Late Late Show episode and is controlled and voiced by comedian and voice actor Josh Robert Thompson. Imahara portrayed Mr. Sulu in the web series Star Trek Continues episodes "Pilgrim of Eternity" (2013) and "Lolani" (2014). Imahara was interviewed on TWiT's Triangulation (Episode 121) on 25 September 2013. Imahara played Lt. Masaru in the 2015 movie Star Trek Renegades. Imahara has also partnered with Mouser Electronics to kick off their "Empowering Innovation Together" campaign, where he will host several webisodes. In 2015, he appeared in the TV movie Sharknado 3: Oh Hell No!. Imahara is taking an active part in advising Team USA in a giant-robot battle between American company MegaBots and Japanese company Suidobashi Heavy Industry. ^ Andreeva, Nellie (September 4, 2016). "Netflix Greenlights 'White Rabbit Project' Reality Series From 'Mythbusters' Producers". Deadline Hollywood. Retrieved December 9, 2016. ^ "USC Alumni Association - Grant Imahara Class of '93". University of Southern California. Archived from the original on 24 February 2015. Retrieved 24 February 2015. ^ Mammy, Joe (May 27, 2007). "Have Soldering Gun, Will Travel". Joe-Mammy.com. Retrieved 2010-10-05. ^ Casino, Khier (December 8, 2016). "Beloved MythBusters Host Proposes to Long-Time Girlfriend With $20,000 Ring". NextShark. Retrieved December 25, 2016. ^ "Beneath The Dome - Credits". StarWars.com. Lucasfilm. Archived from the original on June 24, 2008. ^ Thomas, Christian M. (March 29, 2008). "'Mythbuster' Grant Imahara gives Northeast State audience lowdown on popular show". timesnews.net. Retrieved 4 July 2009. ^ "'MythBusters' Cast Kari Byron, Grant Imahara & Tory Belleci Out". Latino Post. ^ "'Mythbusters' Build Team is back in the first trailer for 'White Rabbit Project'". Digital Trends. 2016-11-28. Retrieved 2017-03-26. ^ "ILM - Architects of Evil". Fan Films. TheForce.Net. April 2004. Retrieved 2010-10-05. ^ Svoboda, Elizabeth (February 2006). "Grant Imahara: Debunker in The Box". Spectrum. IEEE. Archived from the original on 2008-04-10. Retrieved 2010-10-05. ^ Hibberd, James (March 1, 2010). "Mythbuster: I can build Ferguson a robot sidekick". The Live Feed. Archived from the original on August 30, 2010. Retrieved 2010-10-05. ^ "Cast and Crew - Star Trek Continues". Archived from the original on 2012-08-16. Retrieved 2012-08-16. ^ "Star Trek Continues Webseries on Kickstarter". ^ "Empowering Innovation with Grant Imahara - Mouser". Retrieved 19 March 2017. ^ Feeney, Nolan (August 19, 2015). "A Team of Americans Is Building a Giant Robot to Challenge Japan In Hand to Hand Combat". Time. Retrieved 2015-08-21. ^ "We built the Home of the Future with Grant Imahara". The Verge. Retrieved 2018-08-22. Wikimedia Commons has media related to Grant Imahara.